I would have loved to have selected my Easter brunch menu back in February, spent a couple of Sundays making and perfecting and photographing each recipe, and sharing what I learned with you all so that you could go on to create flawless Easter brunches of your own, with plenty of lead time for appropriate planning. 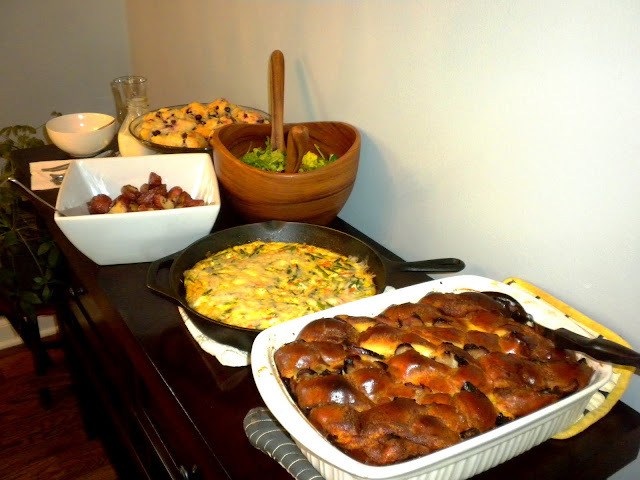 Instead, I gave you all links to the recipes I would be making for the first time for my own Easter brunch. Now that I have perspective, I want to share how it went and some adjustments to some of the dishes so when you make them, they will be absolutely exquisite. Above is the table. Set for 9. You don't see chair backs along the window because we only have 6 chairs and for those 3 seats we used stools. Our dining room table is countertop height - something we did with seeming foresight to the gargantuan lab we would one day have. If we had a regular-height table, Cooper would have silently licked everyone's plate clean while they were sipping their Strawberry Bellinis. Let's run through the menu. Mario Batali's Fresh Strawberry Bellini: Perfection. Not sweet at all, like you might expect. You will be surprised at how little there is in a bottle of Prosecco, though, when you pour it into a standard-sized pitcher. So use your smallest one. Tyler Florence's Blueberry Scones with Lemon Glaze: Turns out, I actually wanted to make scones instead of the Strawberry Meyer Lemon Muffins I posted with my menu. I'm so glad I did. First, let me just tell you that I have never ever ever ever ever been let down by a Tyler Florence recipe. Ever. He is a God. A God that has a magical way of transferring his power to everyday humans so we can be godly in the kitchen as well. The only suggestion I have is to buy a carton of heavy cream bigger than a half pint (exactly 1 cup - what the recipe calls for) because I needed just a tablespoon more to really bind the dough together. They still came out as one of the rockstars of the morning, however. And, if you've never made scones before, there is one rule to making scones: DO NOT OVERMIX. Well, after you've incorporated the butter into the flour, anyway. When you add the cream, don't mix all the way - you'll finish the mixing as you incorporate the blueberries. And then you'll mix it some more when you shape it out onto the counter. A light hand will create light and flaky scones - which is what you want. Phew. Enough about scones. Or scons, if you want to be British and serve them for breakfast on Friday while you watch Prince William marry Miss Kate. Me, I'm DVRing. Emeril Lagasse's Asparagus and Smoked Salmon Frittata: Believe it or not, this was my first time making a frittata, and it will definitely not be the last. Such a simple concept that can be adapted easily, using whatever ingredients you might have on-hand. I had gone to the farmer's market the day before to get some fresh asparagus, and I'm glad I did. I will say that this dish came out fishier than I expected. Coming from me, that's pretty impactful, as I am a huge seafood lover. All-in-all though, the smokiness added depth to this dish and it was devoured by all. Martha Stewart's French Toast Strata with Sausage: First of all, Martha - let's just call this what it is. Baked french toast that just so happens to have slices of sausage layered between the bread slices. This dish needed a few adjustments. First, the egg base. It had only maple syrup added to it. Ditch the maple syrup, use a little bit of sugar instead, and for heaven's sake, please add some cinnamon and nutmeg. The recipe called for chicken sausage, and there is a brand I love that makes a delicious maple apple version. I contemplated whether I should use that or a spicy version to contrast the sweetness of the dish. My gut told me spicy, but the self-proclaimed sausage king told me sweet, so I listened to him. Don't listen to him! Use a savory sausage. Hundred pershent. Ann Burrell's Mixed Green Salad with Parmigiano Crisps. I delegated the salad to my mother. She did not make this salad. Hers was probably better. She met me at the farmer's market and she got some fresh greens to use for this dish, and it was exquisite. She made a fabulous dressing to go with it, and everyone was raving about it. Even the teenagers. Tyler Florence's Herb-Roasted Potatoes: In my mind, there were two stand-out stars from our brunch on Sunday, and it just so happens they were both Tyler Florence recipes. I told you - Culinary God. These babies were perfection. One tiny note - rub a little olive oil on the pan itself, ensure all potato pieces have a cut side down, and do not touch them until they are completely done. That cut side that has constant contact with the pan the entire 40 minutes will have the perfect crisp to it. Make sure you rub the oil on the pan as well, or you'll lose some of those priceless crispy sides because they are glued to the pan. Bobby Flay's Rum Buttered Grilled Glazed Pineapple with Vanilla Scented Mascarpone: I had planned that we would have this a la minute following the mini lacrosse practice that took place in our front yard (The Stallion used to play and coach and now has much younger siblings beginning to follow in his footsteps), but it never happened. There was no room left in anyone's stomach, and not enough time left, either. I was able to debut my great grandmother's cut glass glasses, which were absolutely stunning on the table. Instead of using the 'bunny' fold on my napkins that I had posted, I instead opted for a pocket fold and tucked a tulip into the napkin of each place setting. Bud vases were placed around the table to hold them after everyone was seated. All-in-all, it was great having family over, and I know it's something we'll continue to do. 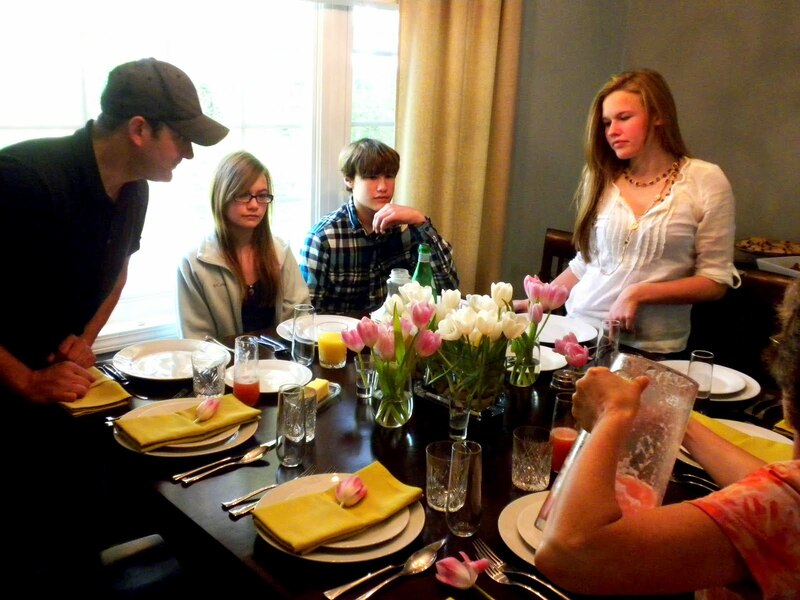 Just probably not on the days where we have two more family meals to attend. Carly, it was a lovely brunch. Everything was delicious! I agree with you on the adjustments you would make, especially (ahem, sorry Stallion) using savory sausage in the baked french toast instead of maple.